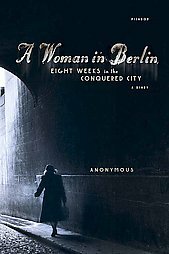 This past week, I read A Woman in Berlin: Eight Weeks in a Conquered City. It was hard to get through, not because of the writing which I loved considering the material, but just with how emotional the book was. The novel is the diary of a woman who recorded daily life during the Russian occupation of Berlin during the second World War. For years, the book was published without credit, since its author feared what could become of her if it was known that she had in fact written it. It is presumed that the diary actually was of German journalist, Marta Hillers. The diary largely chronicles the brutality and atrocities that can and do occur during wartime. The author descriptively records the multiple rapes she suffered at the hands of the Red Army, the murders, the suicides and the bombings that prevailed in Berlin following Hitler’s fall from power. She raises the question, is it really the more humane thing to do to leave women and children behind while men fight in wars? Without protection, women do become the booty of war (pun intended) and they die, along with the children. The author is admirable because instead of making herself the victim, which she no doubt is, she rises above that. She uses her mind and her body to keep herself safe and to ensure that she can get food to feed herself and in turn the people that she lives with. Her bravery and courageousness that echoes in her writing is just unbelievable as when she was writing this, there was no end in sight for her. This was her life. The book moves pretty quickly and what I enjoyed most about it was the author’s writing style. Though written in the 1940’s, the book had a more modern feel to the way it was written, completely pulling me into her story and the story of those she lived with. Book Information: A Woman in Berlin: Eight Weeks in a Conquered City is available for purchase with ISBN 0312426119 via Picador. This version was originally published in July 2006.